When the campground is closed, there is a little space to park along the highway across from the campground entrance. It is advisable not to leave valuables in your vehicle when parking along the highway. 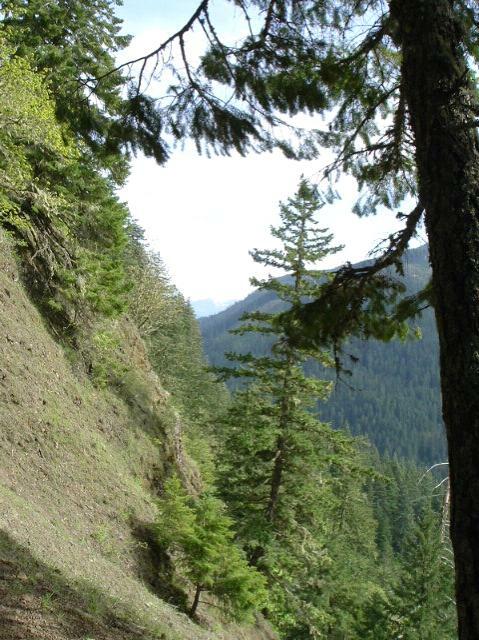 Trail climbs through area of embattled ancient trees, dogwood, and white iris to a view of the Clackamas canyon. Then the grade eases as the route heads into the Roaring River country crossing Grouse Creek. Shortly after the creek another series of switchbacks climb aggressively to the junction with an intermediate access trail off the 4635 Road. After this point the grade eases again for the balance of the route but the trail becomes rather less interesting. There are no blazes beyond the access trail junction as the trail from here to the Grouse Point Trail 517 has been re-routed, avoiding roads and logging.